Believe it or not, a fall insecticide application is crucial to the vitality of your lawn, as well as the comfort within your home. Lots of bugs are active in the fall. They are either preparing their colony for the winter or just looking for food in order to survive another day. Piles of bugs on your windowsill or spider webs in your home are evidence of their activity. For many pests, the cooling fall temperatures trigger an instinctive migration toward warm shelter areas before winter hits. Your home is a prime location for bugs, spiders, and rodents to weather winter storms. In order to get to your warm, cozy house, most of these pests need to cross your lawn. As a result, leaf-eating bugs may wreak havoc along the way. A fall insecticide application along the perimeter of your property is a super easy way to deter a wide range of pests from coming onto your property. A trained technician can quickly apply a broad-spectrum product to the perimeter. He can also add mulch, ground cover, and shrubs to thoroughly protect your property from invaders. The Atlanta area enjoys pretty nice daytime weather in November. It is nice to be able to open up the windows and let the warm breeze air out the house. If you have holes in your screens or insufficient weather stripping, the small luxury of open windows can make it easier for bugs to enter your home and set up shop. In addition to fixing your screens and weather stripping, a fall insecticide application can help prevent an autumn invasion. Few pests can ruin an afternoon of backyard fun quite like fire ants. In Atlanta, we find that fire ants are most active in the spring and fall. Once you have had your ankles covered in itchy, painful bumps from these guys, you never forget the agony. Having your lawn treated for fire ant control in the fall is a good way to ensure that you can comfortably use your backyard for as long as the good weather holds out. 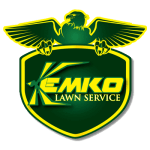 Kemko Lawn Service knows the insects of the Atlanta area, and many of them cause issues during the fall months. We also know how devastating those pests can be to your beautiful lawn. Our fall pest control application services can help you protect your home and lawn from damaging insects for months to come.